AGRIGENT with the Valley Valley Park. In an atmosphere of total tranquility, an ideal ingredient for physical and intellectual relaxation. Large private veranda equipped with panoramic sea front view, parking space. The apartments are independent and you can rent the whole villa or just one of the apartments. The studio consists of a large kitchen, double bed and bathroom with shower. We were three persons staying in an apartment on ground floor comprising two rooms, one common room with kitchen, for dining and sleeping and one bath room. The apartment was with a terrace. The apartrment was cleaned and well maintained and good order on arrival. We had a good time together with the owner of the house. Sicily is with many activities and we can recommend the place and the island to friends. Zeer mooie woning, super uitzicht en vriendelijke eigenaar! Complete inventaris, magnetron, oven, koelkast, netjes onderhouden, zwembad iedere dag schoongemaakt. Uitzicht op zee! 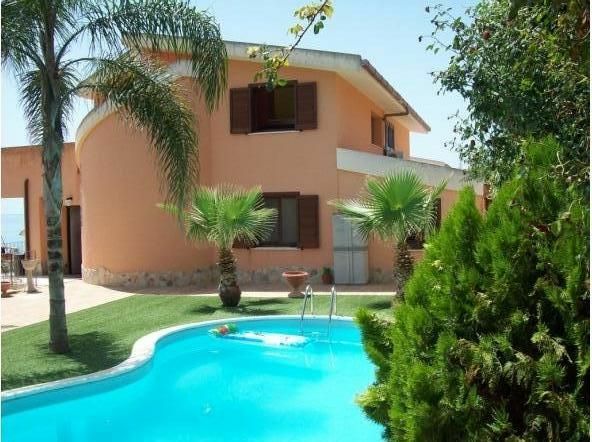 non solo una piacevole piscina privata contraddistingue questa casa vacanze, ma anche un bel terrazzo, da utilizzare dalla colazione alla cena, dotato di copertura con gazebo e con bella vista sul mare. La camere sono abbastanza ampie, così come la sala con angolo cottura. La camera matrimoniale e la sala sono dotate di aria condizionata, indispensabile nelle giornate più torride. La posizione della casa è in una zona esterna a Sciacca, distante dal centro circa 5 km. Questo ne determina la tranquillità ma anche l'unica pecca in quanto per uscire la sera per una passeggiata l'auto è indispensabile.